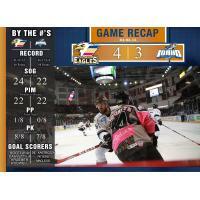 Eagles Soar Over Steelheads, 4-3 BOISE, Idaho. -The Colorado Eagles (41-22-3-3) scored with only eight seconds left in the game to bury the Idaho Steelheads (46-17-2-4), Friday night at CenturyLink Arena. The Steelheads would begin the scoring on Friday night as forward David de Kastrozza found himself in the right place at the right time, hammering home an easy rebound to give Idaho the 1-0 advantage with 6:04 remaining in the first. Colorado would answer just over three minutes into the second as forward Darryl Bootland came wheeling around the slot, firing a wrist shot over Steelheads goalie Olivier Roy's shoulder to bring the gave to a 1-1 tie. One minute and 21 seconds later, Idaho forward Taylor Peters came streaking in on the short-handed opportunity, danced around a defender, and sniped the Steelheads into the 2-1 lead over Eagles netminder Clarke Saudners' left shoulder. Colorado tied the game up once again as forward Kyle Kraemer made his way down the slot, sniping the puck past Roy as the Eagles pulled the game to a 2-2 score. The Eagles would gain their first lead of the night 2:05 into the third as forward Derek Rodwell curled around the back of the net, turned around and sniped Colorado into the 3-2 lead. Idaho wasn't done, as forward Wade McLeod tied the game up on the power play, scoring on a deke with 3:39 remaining. The Cardiac Kids couldn't help but make it entertaining in the final minute. Eagles captain Trent Daavettila came around on a wrap around, beating Roy far-side to give the Eagles the 4-3 victory. With the win, Colorado narrows the race for home -ice advantage in the first round against Ontario, now trailing the Reign by a point. Tickets to all Colorado Eagles home games are on sale and start at just $16 per seat. Contact the Eagles ticket office at 970-686-SHOT (7468) or visitwww.ComcastTix.com to reserve your seats today and be part of the action!